The hypothetical church facade - below - drawn by Sebastiano Serlio, 1475-1554, was one of the illustrations in his 'Architectura', published in 5 volumes, beginning in 1537. It was translated from Italian into Dutch, then into English in 1611. Christopher Wren and Inigo Jones both had copies. 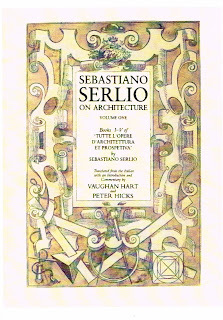 In 1996 it was translated again by Vaughan Hart and Peter Hicks. For me a drawing of a building is as good evidence of someone's thinking as his/her words in a book. Here I have both. This image is informed by geometry. The extravagance of details - plinth blocks, double columns, not one but three oriel window, stone worked in patterns, is startling. Nothing here is backdrop; all is to be seen. 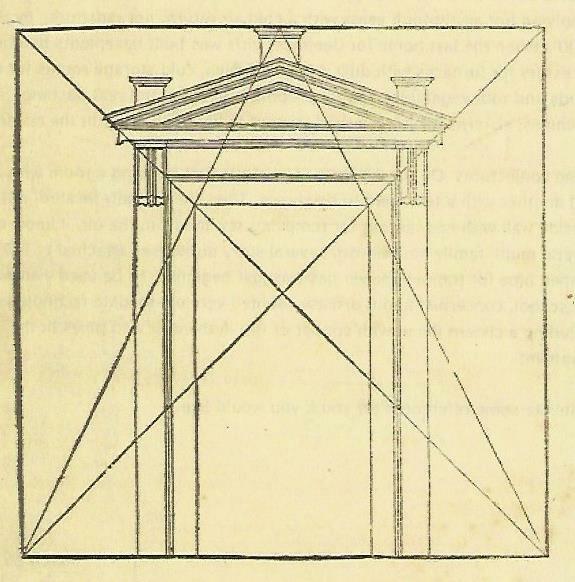 Serlio holds it all together with geometry. I've put the diagrams for the image at the end of this post because I want to first show a few explanations he gave about the use of geometry. 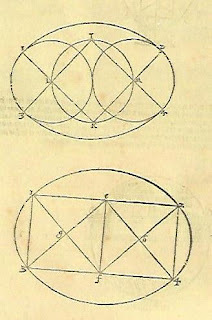 Serlio's Book I, On Geometry, is not very long, 13 pages. 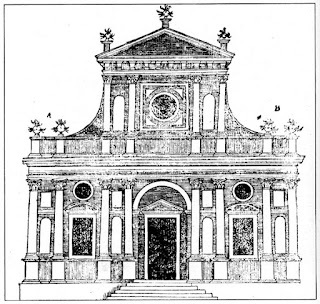 He presents a problem to the reader on the last page: how to design a door for an existing church. 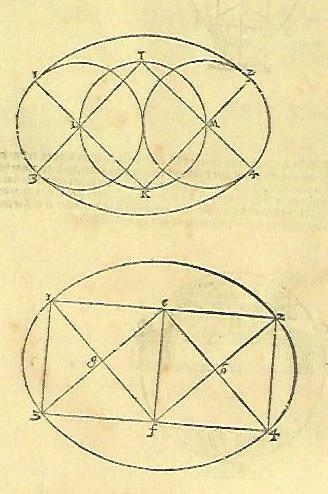 "the diagonal lines,and the other two cross cutting lines" will not only give you "the width of the door but also the places and points of the ornaments of the same door as you may see here in this figure." The diagram is part of what today we call The Rule of Thirds. It can regularly be seen in Pre-WWI American construction in layout and design. Serlio also shows 3 ways to lay out an ellipse. Here are two. Draw a circle and add one on each side. The left and right sides of the outside circles are the ends of the ellipse. T and K become the centers for radii to draw arcs of the upper and lower sections of the ellipse. "Then placing one point of the compass at K you must " draw "a line with the other point from the figure of 1 to 2.... This figure is very like the form of an Egge." The second example begins with 2 squares and their diagonals. The radius for the ends of the ellipse is half the diagonal, g to 1 for example. The radius for the top and bottom of the ellipse is the whole diagonal, f to 2. 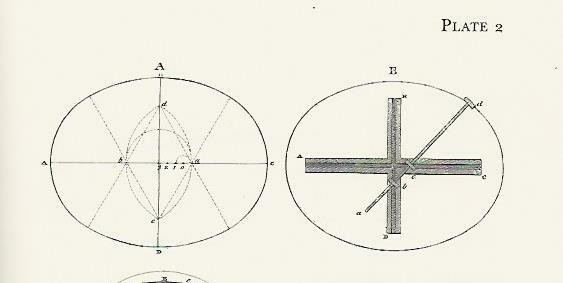 Here is the diagram Owen Biddle of Philadelphia added to his instructions for drawing an ellipse in his pattern book published in 1805. He did not seem to know of Serlio's layout which looks to be simpler. The main floor is made up of 2 squares, or perhaps 1 square in the middle and a half square on each side. The upper floor is also 2 squares if its arcs are included. I drew in red the diagonals of the squares on the right side. I also extended the main floor diagonal with a dotted line on the upper floor to show how one part is an extension of the other. 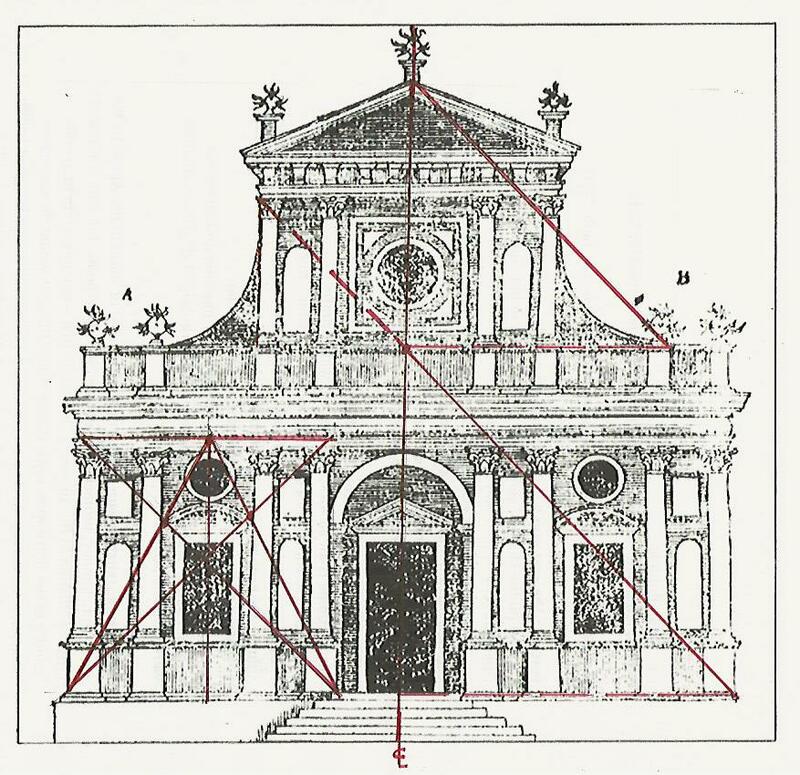 On the left side I drew the diagram shown above that Serlio drew for finding a door. 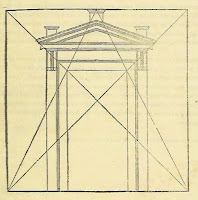 Here it indicates the location of the oriel window and the edges of the rounded pediment over the window. This engraving's proportions are a little off. Is it because it's just hypothetical, or because it has been reprinted so many times? 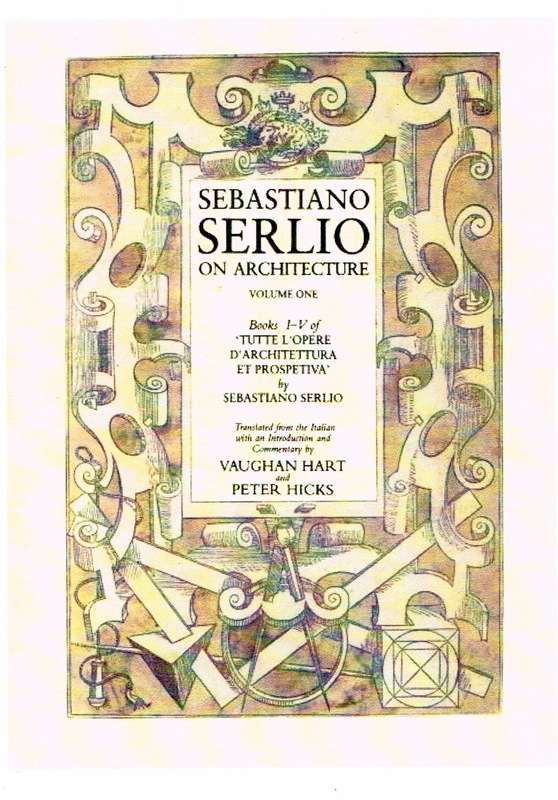 Footnotes: I am reading Serlio's Architettura, Book I, 1611, English translation, on-line, printing parts of it and then enlarging the page. The English is archaic. So is the spelling. The printing blurred. If I read it out loud it is easier, much like reading hand written property deeds from the 1830's and '40's. The diagrams are clear! 2 books on early American libraries do not mention Serlio. American Architects and Their Books to 1848, edited by Kenneth Hafertepe and James F. O'Gorman, 2001, U. Mass. Press, Amherst. MA. Architectural Books in Early America, Janice G. Schimmelman, 1999, Oak Knoll Press, New Castle, DE. 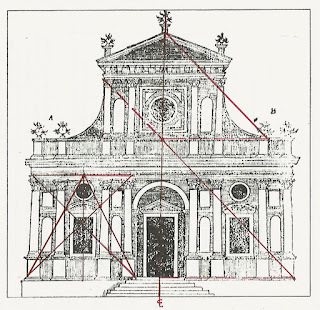 The translators - Vaughan Hart and Peter Hicks - have not heard of Practical Geometry and think Serlio invented 'Lines' ( see Glossary, p. 458, Linee occulte. They also seem to imply that the tools illustrated on the cover ( see above) are symbols, not the actual tools masons used in construction. They do not seem to view this book as a manual for practitioners, but as a philosophical treatise. Still I'm glad they translated it.